Trader Joe’s will put pumpkin in anything. Some of these things are expected – such as their pumpkin soup, some of these things are unexpected such as their pumpkin croissants. Trader Joe’s Pumpkin Rolls with Pumpkin Spiced Icing are definitely an example of the later. Has anyone ever looked at a cinnamon bun and thought “Somebody should really take the cinnamon out of this and replace it with pumpkin. And pumpkin flavored icing.” No, of course not, but Trader Joe’s did it. They did it, and it’s actually pretty good. Trader Joe’s took the same dough they already use in their cinnamon rolls, but have had the cinnamon goo that fills the roll’s folds replaced by a puree of pumpkin and pumpkin pie spices (e.g. nutmeg, cinnamon and clove). Trader Joe’s Cinnamon Roll dough is some of the best you can find on a grocery store shelf, so the result is a delicious pastry roll that cooks up beautifully golden brown, with a soft, warm and chewy center. The pumpkin puree that replaces the cinnamon mash is of the same consistency, giving the dough that ooey-gooey stickiness that is essential for a truly satisfying sticky bun. While the buns feel every bit as good as a cinnamon roll, they don’t quite taste as good. Don’t get me wrong – the pumpkin bun is delectable and every bit as soft and sweet as a cinnamon bun, but cinnamon buns are damn near perfect. As good as the pumpkin rolls were, the sticky, bubbling hot spiciness of true cinnamon buns are better, just by dint of being a cinnamon bun. 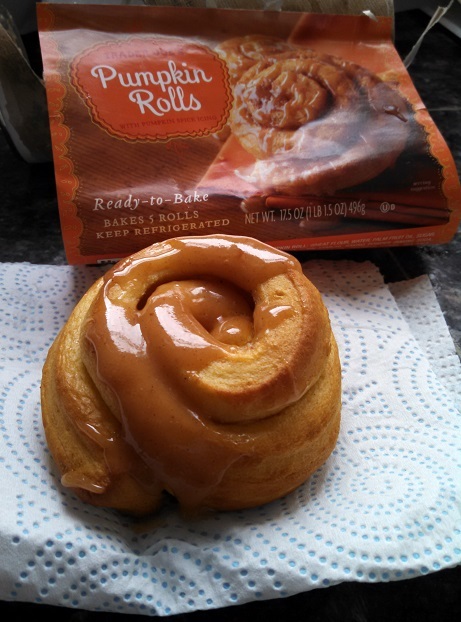 That’s not to say the pumpkin rolls don’t taste good in their own right – they certainly do. The pumpkin rolls are sugary sweet and delicious, and bring in the taste of pumpkin and spice without being too overwhelming. It’s a little like the rolls are glazed with pumpkin pie filling instead of cinnamon and sugar – and while that’s good, it’s not better than the cinnamon and sugar. The exact same can be said of the pumpkin spice infused frosting. It’s delicious, sugary, thick and sticky – just like good frosting should be. There’s more than enough to ice each bun, and matches just right with the pipping hot rolls – but it would have been even better if it had been a classic cream-cheese frosting. Once again, we’re faced with the notion of why to buy this at all. Simply because it’s novel is the only compelling argument I have. Pumpkin season comes but once a year, and it’s fun to pick up a few pumpkin rolls to ring in the autumn. 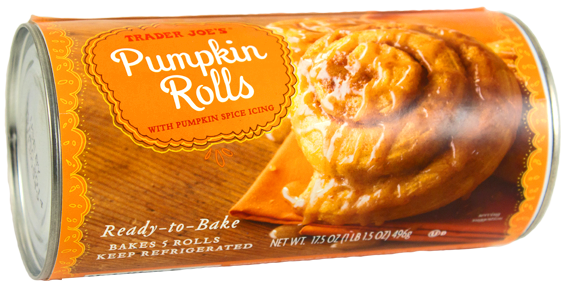 If you feel that little nagging call to celebrate the Harvest through moderately varied food stuffs, then by all means pick up Trader Joe’s Pumpkin Rolls with Pumpkin Spiced Icing – they’re delicious and you’ll enjoy every bite. If, however, the idea of pumpkin rolls for pumpkin roll’s sake doesn’t do it for you, rest easy knowing that you’re not really missing out. Their difference is valuable, but it’s unlikely you’ll ever prefer them to the real deal. 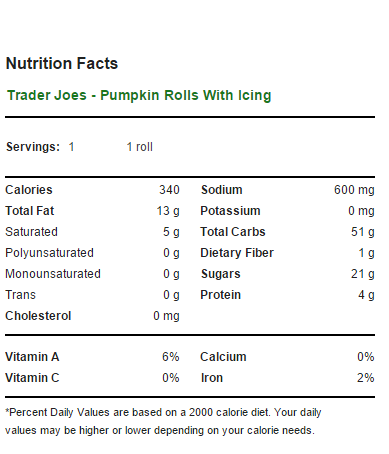 The only thing to be aware of is that, as in Trader Joe’s Cinnamon Rolls, the Pumpkin Rolls only come five to a pack. Odd numbers are terribly inconvenient when it comes to cooking for any size table, and prime numbers are all the more so. Unless you’re making breakfast for exactly 5 diners, or cooking for very lopsided appetites, you’ll want to pick up 2 cans to make sure things divide evenly. If I thought highly enough of Trader Joe’s marketing department, I’d almost accuse them of doing that on purpose – the crafty bastards. Would I Recommend Them: Sure – they’re quite tasty, in their own way. Would I Buy Them Again: Nope, I’ll go back to cinnamon rolls. Final Synopsis: Almost as delicious as cinnamon rolls. That looks sooo good! I want to try the Trader Joe’s Pumpkin Croissants first though! I liked these, but I don’t think we enjoyed them enough to buy them again. I completely agree with you about switching back to the cinnamon rolls. I think these needed something a little tangy to offset the sweetness! Not their best pumpkin product, but certainly not the worst! Thanks for your review!